As we entered 2016 I made a culinary resolution to rectify three glaring holes in my dining out back catalogue. 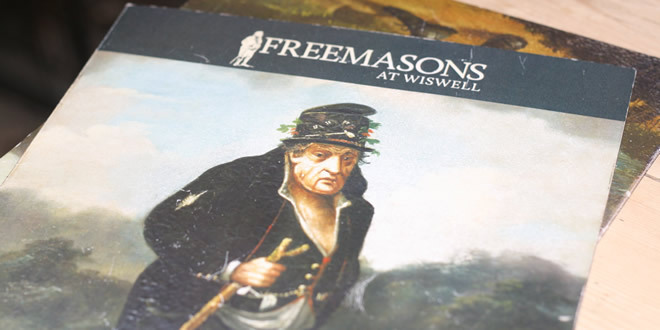 St. John, The Man Behind The Curtain and Freemasons at Wiswell. Before Spring even arrived I had reservations at the first two – in April and May respectively. The latter I visited before the end of January. 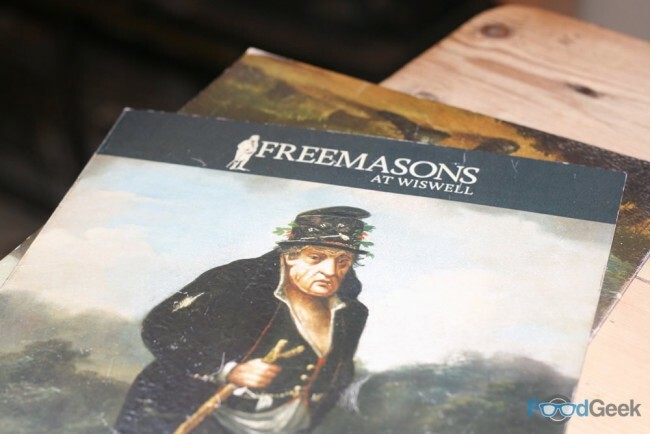 Freemasons is an old fashioned country inn located in the village of Wiswell (pronounced ‘wizel’, amusingly), near Clitheroe, in the stunning Ribble Valley. It’s very much a pub from the outside and that’s matched inside too. Comfortable and homely but not at all flashy. With checked curtains, wonky wooden furniture and animals – both stuffed and painted – on the walls. Fairly unassuming for the Good Food Guide’s ‘Best Pub In The Country’ for the last two years and the only to ever be awarded a cooking score of 7/10. 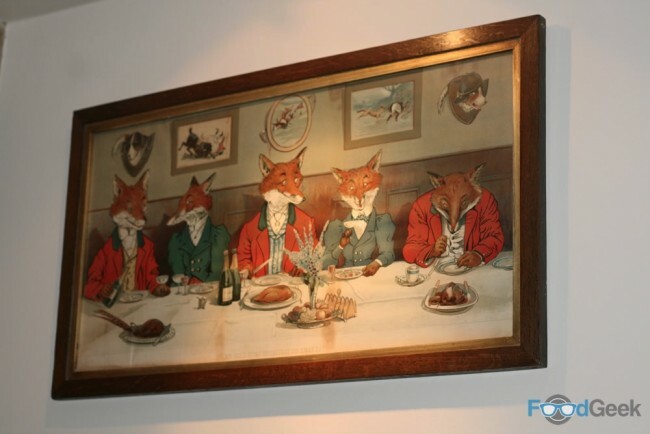 The food, however, is anything but your average pub fare. There’s a good sized A La Carte but we only had eyes for the 7 Course Tasting Menu. 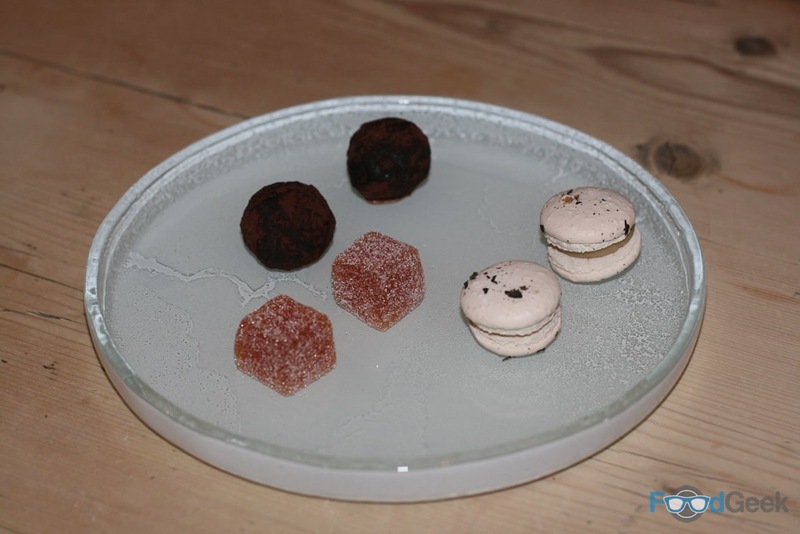 Like all good tasting menus, we started with a number of small dishes. First up, ‘pizza of sashimi tuna’. Little pastry bites with a distinctly Japanese flavour. 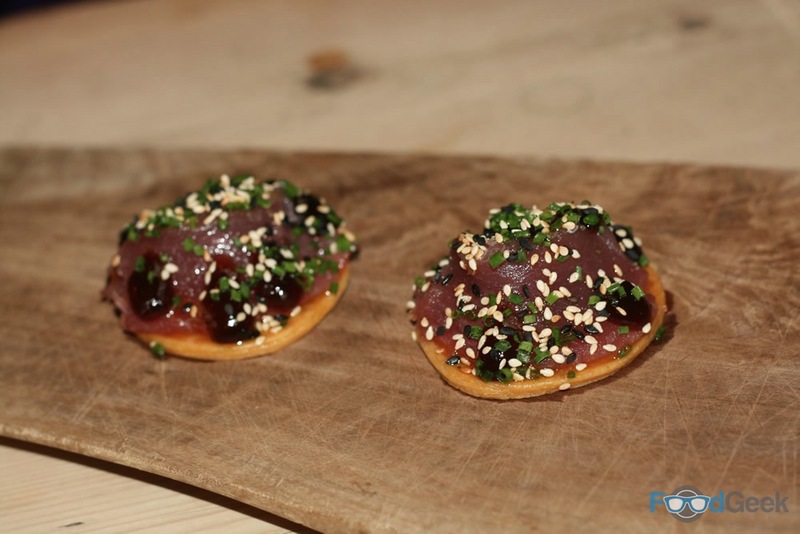 Fantastic sushi grade tuna with ponzu, avocado, wasabi and sesame seeds. We could smell the next taster before we saw it. 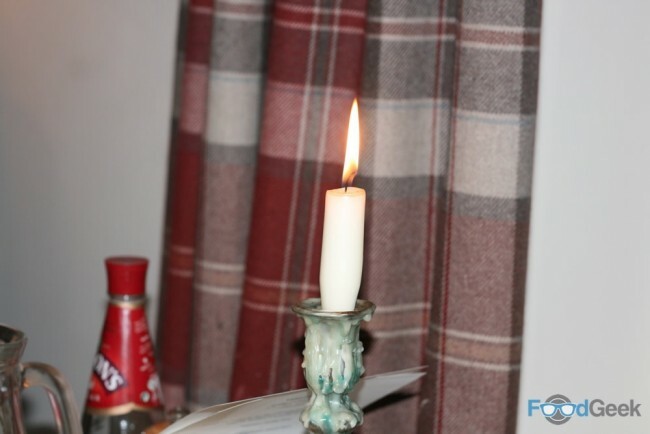 As the waiter approached our table a gorgeous aroma of burning rosemary filled the room. 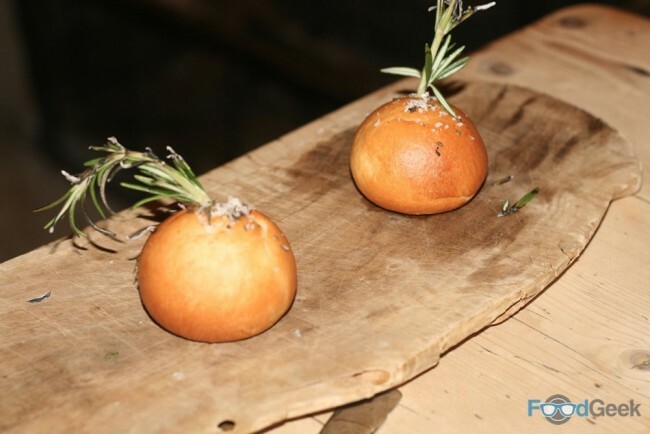 He put down a wooden board with two perfect mini brioche buns, out of each poked a sprig of smoking rosemary. The best smelling incense sticks in the world. The soft warm brioche was superb. 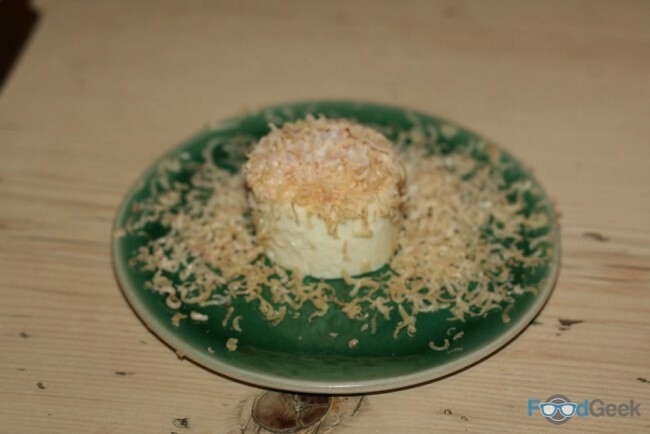 Made with lamb fat it was incredibly light and fluffy and served with a rich crème fraîche and foie gras butter. 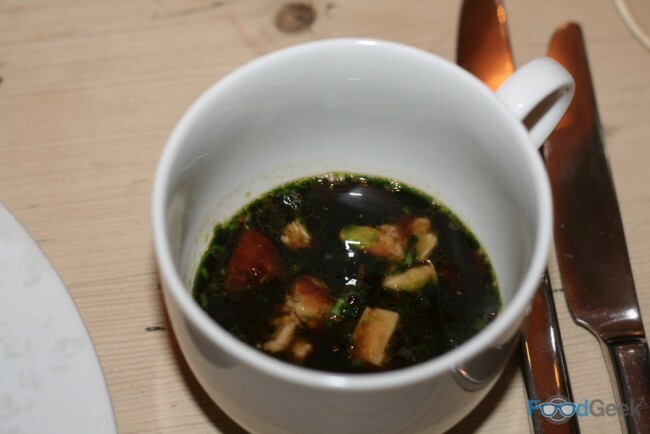 The first proper course, listed on the menu simply as ‘Soup’ was a delightful bowl of interesting flavours and textures. 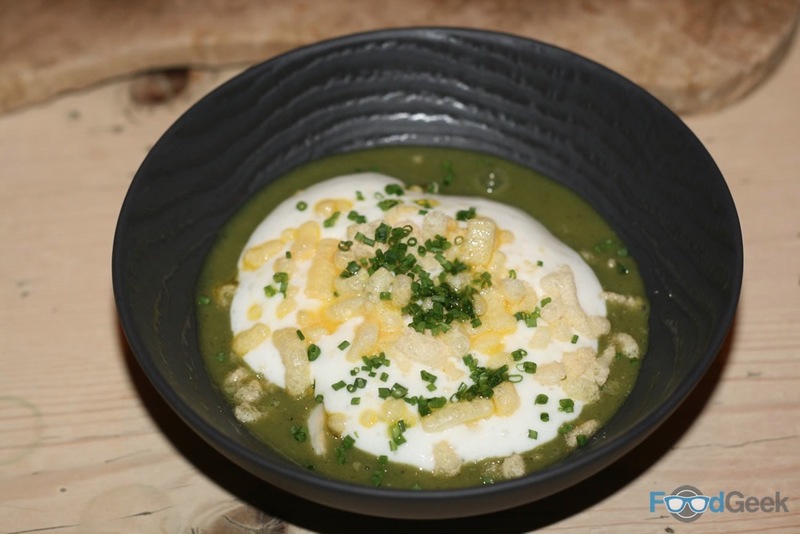 A base of char grilled leek and smoked haddock soup was tasty enough but taken to the next level with the addition of luxurious crème fraîche and crispy puffed rice. 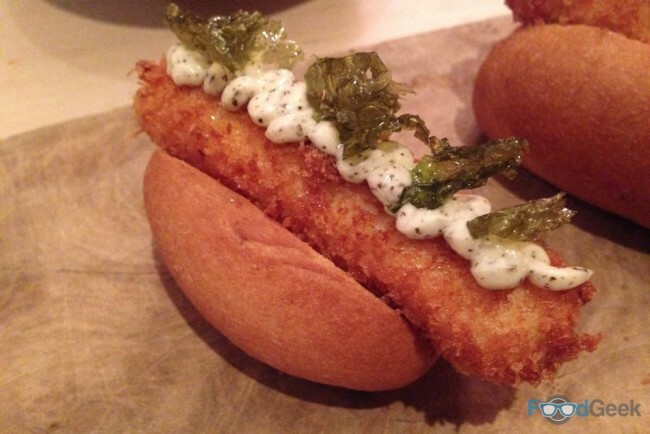 Better still, the soup was served with a cute mini ‘Fish Finger Hotdog’ on the side. 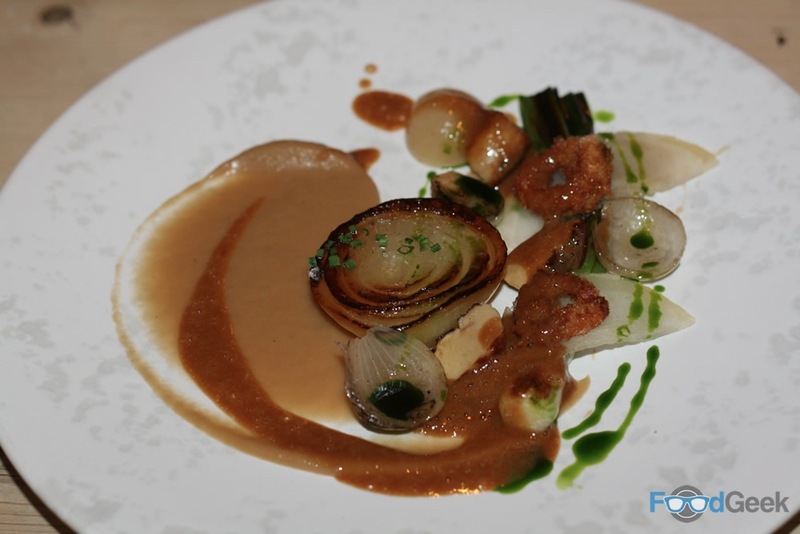 I had no idea what to expect from a dish named ‘Cevennes Onion’. I now know that Cevennes are a variety of onion from south central France. Followed by another beautiful looking plate, ‘Native Lobster’. 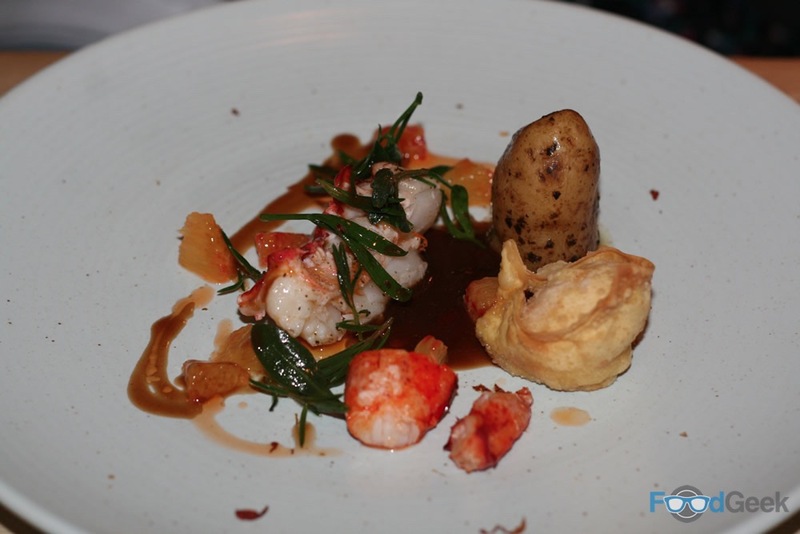 This was my favourite dish; a perfect butter poached lobster tail with a crispy wonton made from the claw meat and potatoes cooked in seaweed. 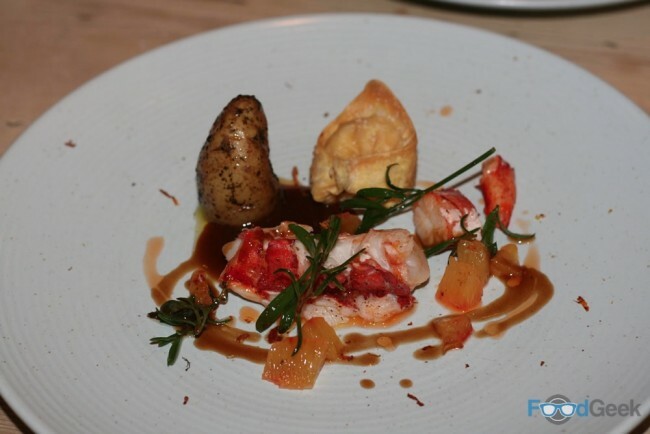 The secret ingredient was blood orange which worked amazingly well with the lobster. If the lobster dish was my favourite, the next, ‘Suckling Pig’, was a very close second. 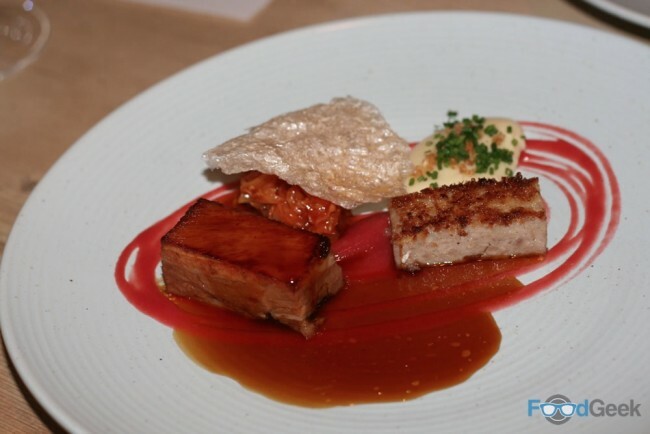 A generous piece of succulent maple glazed pork belly was accompanied by a very good sausage (house made, naturally), indulgent Lancashire cheese potato puree, rhubarb, sauce of mead and… kimchee. I can’t imagine Lancashire cheese, rhubarb, mead and kimchee feature on many dishes together but they worked so well here. A simply beautiful combination of flavours. ‘Aged Beef’ was the only dish that slightly underwhelmed. Not that the was anything wrong with it, it just lacked the same wow factor as most of the others. 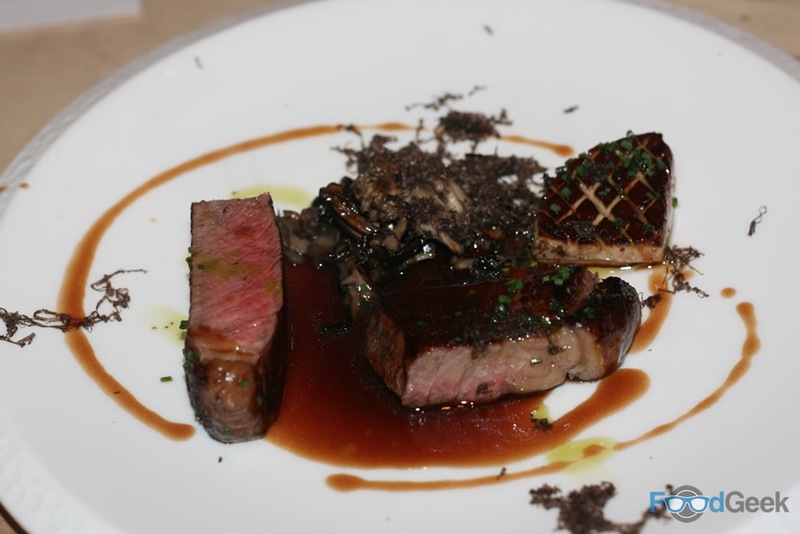 The roast foie gras was exceptional while the rare roast sirloin with mushrooms was just fine. They were all brought together by a very good truffle sauce. 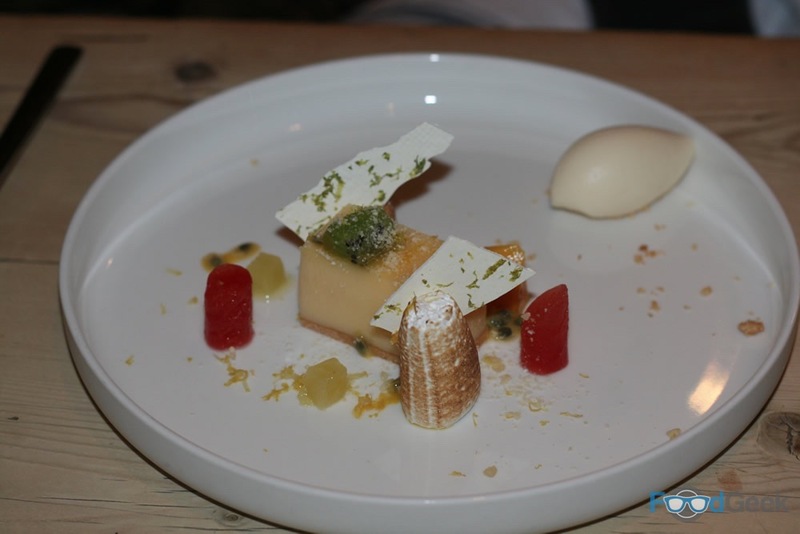 I must confess I wasn’t particularly impressed when I saw the first dessert, ‘Amalfi Lemon’. I’m not generally a fan of ‘deconstructed’ things but when they taste like this it’s easy to forgive. From the popping candy spiked base topped with a glistening slab of sweet yet sharp lemon custard, to the most amazing soft meringue, tropical fruits and an exquisite quenelle of ice cream. It was pure perfection. The second dessert and final course was somehow even better. Perhaps not in overall enjoyment but certainly in its intriguing and clever combination of flavours. Its mysterious title ‘Michel Cluizel Chocolate’ gave nothing away. I’ve since learned that Michel Cluizel is a very highly regarded producer of fancy French chocolate. His luscious dark chocolate was treated with the utmost respect here. 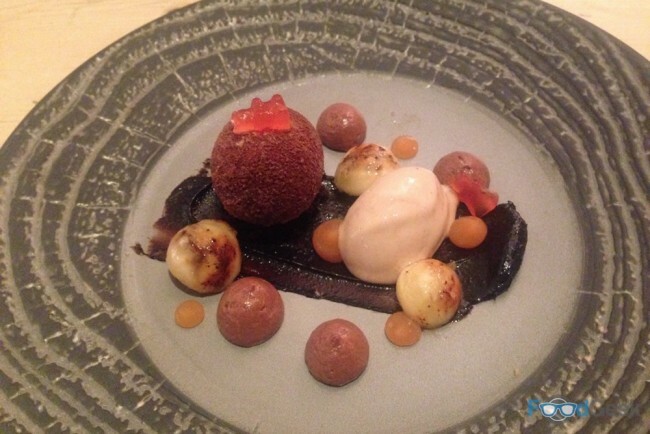 Chocolate and banana is always a brilliant combination but when combined with the more unusual black sesame and sharp, citrusy yuzu it was out of this world. 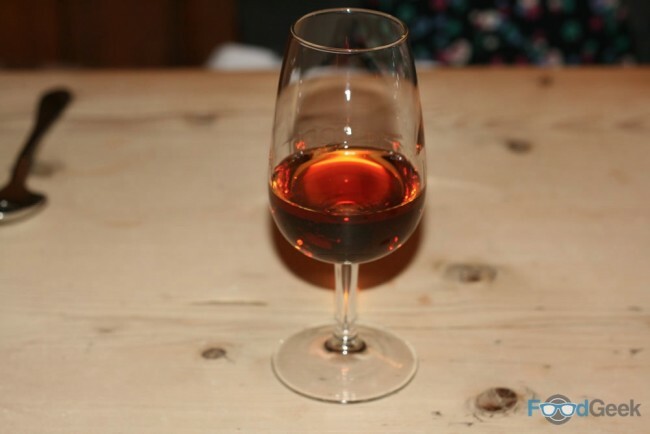 Just as enjoyable was the stunning 2011 Pedro Ximenez served with the final dessert. With a complex array of flavours from dried fruit to chocolate and even a touch of tropical, it’s by far the greatest sherry I’ve ever tasted. 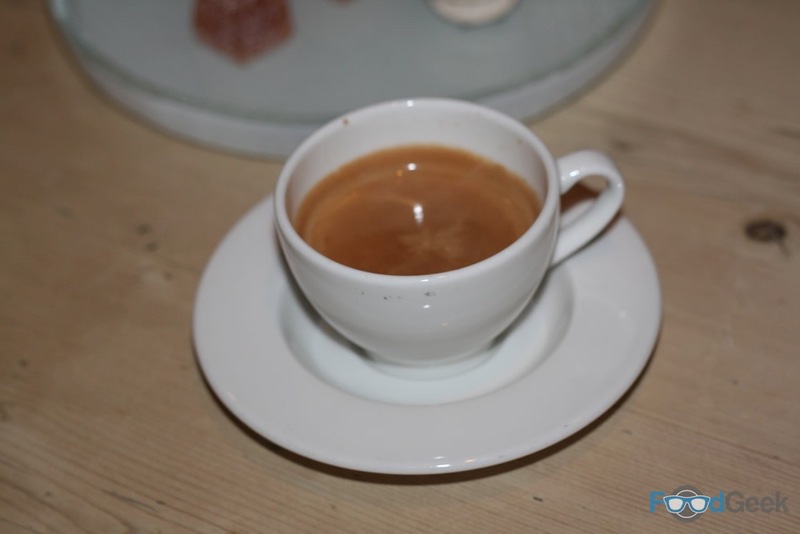 The meal ended with good quality coffee and a trio of ‘Homemade Treats’: peanut butter & chocolate wontons, blood orange jelly and jasmine tea macaron. Each perfectly formed and delicious. 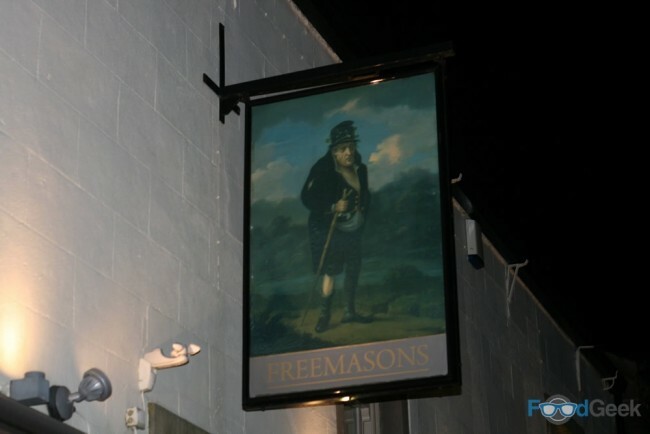 The food at Freemasons was flawless in both design and execution. I absolutely loved the mix of classic dishes with a fun, playful twist and local produce combined with exotic ingredients. 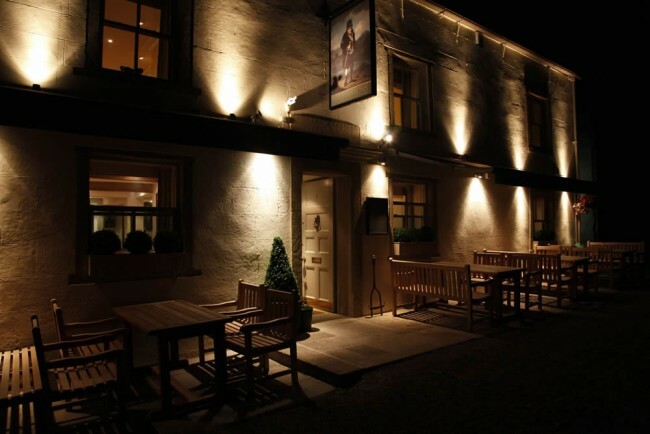 Owner and head chef Steven Smith is clearly hugely talented and could easily be running a top fine-dining restaurant in any city centre. I for one am glad that he isn’t, I’ve no doubt his locals are too. Despite only being January I know several of these dishes will remain as favourites no matter where I eat for the rest of the year. Really the only negative was that the level of service didn’t quite match the food. It’s not that the service was bad, the staff we encountered were all friendly enough. But there were several times when there simply wasn’t anybody around when we needed them. Plus we had to ask for more drinks on a few occasions and were missing knives and forks for one course. There was also several drinks that we hadn’t ordered when we received the bill. They were removed immediately when questioned but all these little things add up and ultimately did detract from the overall experience a little. Things like that just don’t happen in most places with food of this standard. Maybe I’m being overly critical. I mean, I appreciate that it’s a pub and supposed to be a relaxed, informal setting. 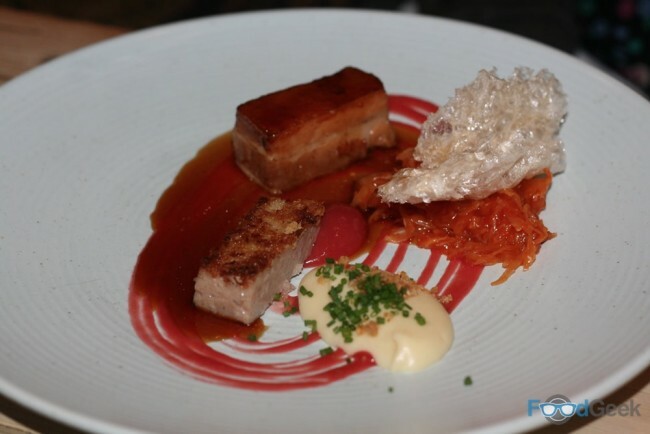 I just can’t help expecting a slightly higher standard of service when paying upwards of £200 for two people but mainly I just think it’s a shame to leave with even the slightest negative feeling when the food was so amazing. It absolutely won’t stop me eating there again, though. I’d serve myself if I had to, I just need to eat that food again, no matter what.